Garthmoor is an island that lies off the far western edge of the continent of Japethe to the west of the Isle of Albyn. It is separated from that larger island by the narrow Sudric Sea. To the west are the vast reaches of the Levian Ocean, once thought to be uncrossable. Garthmoor's capital is, in theory, the village of Tamhair, near the heart of the island. The country has no known great spirit, which may account for the repeated invasions from abroad. Its symbol is the white hart. 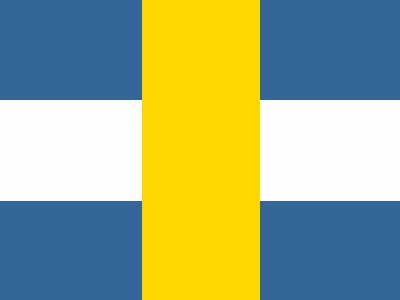 Its flag is either four golden crowns on a field of azure or a thick horizontal silver bar crossing a thick vertical golden bar on a field of azure. The island itself is ringed with costal mountains that surround the low, fertile plains at the center. The mountains hold many forest-filled vales which the Garthans avoid with reverence that borders on paranoia. The western reaches are rocky and given to pasture land. It's these reaches that give the island and the nation its name. Garthmoor is an agrarian country with herding being the primary occupation in the island. Wealth and social standing are determined by how much livestock a person owns. Garthans also produce a very potent liquor called whiskey, which is the primary export of the island. For much of its history, Garthmoor relied upon its distance from the rest of Japethe for protection. In the absence of any external threats, Garthmoor became a land of poets, artists, and philosophers. The veil of protection failed in the 10th century when reavers from Sverike brought destruction and terror to the island. Lyonesse then conquered the weakened Garthmoor in the 12th Century. However, with the departure of Taliesin into the west and the subsequent Sundered Crown Wars, Lyonesse crumbled as a power. The occupying Albyn lords and settlers assimilated into the local population. Today, Garthmoor is ruled by High King Cimbaeth Greatshout. Below the High King are four lesser kings who each govern one of the four provinces of the island, which the Garthans call "courts." According to Garthan folklore, the High King has his own fifth court that exists in mystical parallel with the entire island and Tamhair is merely the gateway to the capital. The Garthans are prone to such fantastical thinking, believing that older spirits of the land, whom they call the Fair Folk, are still present and dwell in the mountain vales that overlook the settled lands of the meadowlands below. Philosophers find the lack of a great spirit for this country curious and believe that a guiding spirit of some sort has to exist. The Garthans are only too happy to regale visiting philosophers with never-ending and often contradictory tales of the Fair Folk, famous ancestors, great deeds, and mythical monsters.